Over the past few years, the United States and Canada have finally made their mark in a tradition that’s been a longstanding one in Europe: Music festivals. This is happened to such a degree that it’s nearly impossible to keep track of them all. Wouldn’t it be great if someone singled out all your favorite XPN artists and which festivals they’re playing in one spot on the internet?!?!?! XPN Weekend Arts Crawl…Mother’s Day, juried shows, MOMIX, and more theater than Broadway! Main Line Art Center presents Jewels and Treasures, an exhibition featuring professional yet affordable works of visual art. Proceeds benefit the Art Center’s education and community outreach programs, which reach over 16,000 people annually. Through June 6, with a preview party Friday. People’s Light and Theatre Company presents Woody Sez: The Life and Music of Woody Guthrie. In this biographical musical, four actor-musicians play fifteen instruments, perform twenty-five of Guthrie’s songs, and celebrate the fascinating, beautiful, and sometimes tragic life of an American icon. Through May 25. The Philadelphia Wine and Food Festival is Saturday at the Simeone Foundation Automotive Museum with over 600 wines from around the world, food from some of Philadelphia’s most popular restaurants, an on-site wine and spirits store, and a silent auction benefitting the Children’s Hospital of Philadelphia. Dance-illusionist company Momix returns to Philadelphia with its newest work, Alchemia. Choreographer Moses Pendleton’s latest creation is a multimedia spectacle of invention, thrills, humor and sensuality. Through Sunday at the Annenberg Center for the Performing Arts. Next Sunday morning, scores of musically-involved Philadelphians will gather at the Art Museum steps to re-create an event that took place five years ago. 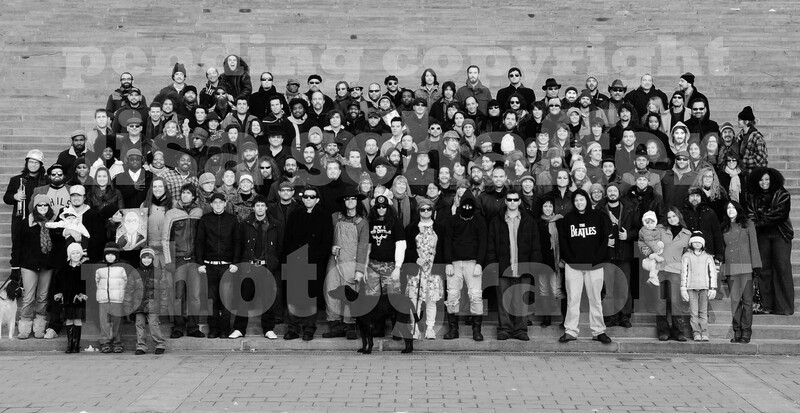 In 2009, local music photographer Lisa Schaffer organized what was billed as the first-ever Philadelphia Music Scene group photo. Through photocopied flyers handed out at World Cafe Live and The Fire, as well as word of mouth, Schaffer rounded up a gathering of musicians, concert promoters, studio owners, a few children and a dog, all of whom congregated just off of Eakins Oval, posing in a motley Sgt. Pepper‘s esque group. In short, Schaffer rules. But something about how she called the resulting image a “Philadelphia Music Scene Group Photo” didn’t sit well with me at the time, and it makes me a tad concerned for Philly Music Scene Photo Shoot II. A quick scan of the faces on display in the 2009 image finds people easily recognizable to the WXPN community – Jim Boggia, Birdie Busch, Rob Berliner of Hoots and Hellmouth, Raph Cutrufello of Hezekiah Jones, Adrien Reju, Mutlu, Ross Bellenoit, Phil D’Agostino. We also see musicians whose names maybe aren’t as prominent but are nonetheless active in the same circle: singer / pianist John Conahan, multi-instrumentalist Anam Owili-Eger of Up the Chain. Behind-the-scenes folks like Hal Real of World Cafe Live, and scene super-fans like Mandy Dollar. There’s just one thing. This is only one group of musicians and associates – a thriving group, to be certain – but it’s nevertheless one small segment of a much broader, more vibrant, more eclectic music community. And while this portrait – an undeniably positive idea – was meant to showcase “The Philadelphia Music Scene,” it might be more accurate to call the resulting crew “The Fire Music Scene” or the “Folk Fest Music Scene” or the “People Ali Wadsworth Has Sang With Music Scene.” I’m teasing a little about that last one, of course, but the point is that this is a photo of a Philly music scene, not the Philly music scene. In the photographer’s defense, I don’t think Schaffer necessarily wants it to be this way. In an invite-only Facebook event page for Philly Music Scene Photo Shoot II, she wrote “Please invite other Philly Music Scene favorites. I know I’m going to forget some. (sorry)” When I swapped messages with her about the shoot on Facebook, she said she invited everybody she could think of, irrespective of genre. Shaffer wishes to shoot an inclusive, comprehensive representation of the Philadelphia music community as much as I want to see one. But that’s going to take some work. Everybody isn’t necessarily connected to everyone else, and the unfortunate result is that some scenes are left under-represented…or barely represented at all. In the 2009 photo, Kuf Knotz appears to be the lone delegate from Philly’s hiphop community. An amazing, thriving community that has nurtured the likes of The Roots, Meek Mill, Chill Moody, Lushlife, Reef the Lost Cauze, Tiani Victoria, Mic Stewart, Zilla Rocca, Curly Castro and more. One face in a crowd of a couple hundred. Suffice it to say, “music scene” means a lot more than folk / roots / Americana. And when the broad term “Philadelphia Music Scene” is applied to something, my ears perk up – and when I look at whatever that thing is, I want to see something as varied, as vibrant, as bustling and exciting as our city looks to me: all styles, all ages, all genders and races, all doing amazing things with music. The 2009 group photo felt, to me, like a party of one group of friends. For 2014, I encourage those who weren’t invited to crash the party. And you know what? They’ll probably be happy to have you. The Philadelphia Music Scene Photo Shoot II is Sunday, April 27th at 7 a.m. on the Art Museum Steps, and if you’re a musician of any kind, I hope you can make it. XPN Weekend Arts Crawl…Imagination runs wild in theater, dance and visual art! The Bearded Ladies Cabaret presents Marlene and the Machine: A German Expressionist Cabaret, Friday and Saturday at the Annenberg Center for the Performing Arts, combining the visual language of German Expressionism and the music of Marlene Dietrich and Lotte Lenya. Locks Gallery opens two new exhibitions, Robert Rauschenberg and The Meaning of Time by Yeesookyung, both with opening receptions Friday. Rauschenberg, one of the most influential postwar American artists, layers everyday images to create thought-provoking juxtapositions. Yeesookyung explores the nature and meaning of time through reinterpretations of traditional Korean Artwork. Both through March 15. At Delaware Theatre Company Friday and Saturday: Why I’m Scared of Dance, a one-woman show by award-winning actress and comedienne Jen Childs about her quest to become a dancer. Vox Populi Gallery is the setting Saturday for Big Eyes, Small Mouth, which features a number of performance artists expressing themselves through doubles and exploring escapism as a means of self-discovery. There’s also a video interlude by Cristine Brache. Inis Nua Theatre Company has a new production Trousers by Irish playwrights Paul Meade and David Parnell, about the funny and complex relationship of two roommates. Through February 23rd. Travel back in time this Sunday at the Glencairn Museum‘s Annual Medieval Festival. Attractions include wool spinning, stained glass making, a Gutenberg-style printing press, music played on period instruments and a live sword fight. The Idiopathic Ridiculopathy Consortium presents Ondine, at the Walnut Street Theatre Five through March 2. Jean Giraudoux’s famed play tells the story of a sea nymph who falls in love with a knight, only to lose her love to the harsh realities of the outside world. The University of the Arts offers Full Moon, a student directed “fairytale-cartoon-musical-farce set in a pizza palace.” Through Sunday. City Theatre Company looks back with humor in Best of 2.0, a selection of the best 10 minute comic plays from the company’s history. Through Saturday. Cerulean Arts Gallery and Studio has a new exhibition Vital Forces through March 1 featuring bronze sculptures by Colleen O’Donnell and painting and prints by Shushana Rucker. Romeo and Juliet in Space: A Space Opera Burlesque, presented by B. Someday Productions, reinterprets the classic Shakespeare play with and extraterrestrial twist. Through February 15.
International House of Philadelphia is screening It Is Not the Homosexual Who is Perverse, But the Society in Which He Lives Saturday. Controversial at the time of its release in 1971, the film follows the experiences of David, a homosexual man living in Berlin. Philly punk band Bleeding Rainbow are coming home for a show at Johnny Brenda’s tonight. With a new record out next January, the nervy, harmonizing four-piece have been hitting the touring life hard lately, playing CMJ showcases in New York last month and spending September out on the west coast. The new record, which follows up this year’s Yeah Right debut, was recorded at Fancy Time Studios here in Philadelphia. Tickets and information for tonight’s 21+ show with Potty Mouth and Batty can be found here. Watch Bleeding Rainbow perform new song “Start Again” below.